We are back from NYC, blistered feet and all. We had a super great time! Months ago I bought tickets to "The Book of Mormon", before it had even opened. It was tempting to sell those tickets now that the show is a big hit, but we didn't. It was funny and offensive and funny and surprisingly sweet. See it if you can. There is a catalog for the exhibit available from Blurb here. The rest of the exhibit can be seen here. Here is my entry in the next exhibit at 1109 Gallery. It is a copy of Paul Klee's painting of the Florentine Villa District. I call it "Florentine". I did not get the watercolor effect right, but the lines are pretty close. This quilt includes some shibori hand dyed fabric that I did years ago and ink jet printed fabric images used with permission from the fabulous book "Rayguns". I love the styling of those mid-century toys, but I am always a bit sad that we can't imagine a future that is not as full of conflict as our present. Bullets make a great quilt border, yes? And here is a quilt that I did quite a few years ago. Most of my efforts are nowhere near bed sizes these days. Here is a detail from a very old and lovely crazy quilt. Hope Ethel enjoyed her outing. I am happy to be included in Dinner at Eight Artists' latest traveling exhibit called "The Space Between". Here is a detail shot of my quilt, which I call "Black and White". How does it relate to the theme? Well, The Space Between black and white is not always grey. I'll be featured on Cinco de Mayo, no less! So do a shot of tequila and check out the artists of The Space Between. This Friday is the final Friday of April (insert cry of dismay about time flying here). Lawrence has been trying to get a downtown arts event rolling on the last Friday called, oddly enough, Final Fridays. There are exhibits and performances all over downtown. Check here for some of the venues (scroll down past the KC info). I will be participating in a textile art event at Hobbs-Taylor. One at a time, on a bed piled high, about 30 quilts will be shown. Each quilt will get about 8 minutes of fame and exposure. There is a bit more information about what will be going on at Hobbs-Taylor here. So here's looking at you, kid. Be there or be square. I will also have a piece up in the 1109 Gallery, but more about that later. Next weekend is my quilt guild's annual show. I will be speaking at the show and trying to sell my book at 11am on Saturday and 1pm on Sunday. The show will be in Building 21 at the Douglas County Fairgrounds (Lawrence, KS). Each year the guild sells small quilts in a silent auction to raise funds for good causes. Here is the quilt I have donated. I call it Flowers in Black and White. The opening reception for the Topeka Competition 30 was very nice, as usual. The folks at the Sabitini Gallery are a pleasure to work with and to party with too. There are great photos of the exhibit here. Be sure to check out all three pages. Scroll down down down to the bottom of the page to click to the other two pages. Here is a photo of gallery director Sherry Best announcing the awards. I am over to the far left... life of the party as always. The opening reception for the Topeka Competition 30 is April 1,from 5:30 to 8:30 at the Sabitini Art Gallery. No fooling. For more information on this exhibit, click here. My two "tar ball" quilts will be part of the show. I blogged a bit about them here. I'm glad they found a place to be exhibited together! Quite a while back, I was invited to be part of a quilt exhibit that has one quilt for each holiday celebrated in the USA. I was assigned Rosh Hashanah, the Jewish New Year. Rosh Hashanah translates literally as "head of the year". Sources claim that Rosh Hashanah as the day the world was created, others say it is the day that man was created. Unlike the wild celebration that the secular New Year's Day brings, it is a day of repentance and introspection. The ram's horn, or Shofar, is blown to alert followers that they are being judged and that their fate for the upcoming year is being inscribed in the book of life. Traditional foods eated on Rosh Hashanah are apples dipped in honey to symbolize a sweet new year. I have a selection of my bird infested work on display at the Community Mercantile at 9th and Iowa, Lawrence, KS. It will be up until the end of July. A couple of weeks ago I enjoyed a walk through the Lawrence Art Guild's annual "Art in the Park". There is always so much talent on display at this event! As usual, I was dismayed to see that the food vendors seemed to be doing much more business than the artists. The art brings in the crowd, and the funnel cake sellers make the money. Oh, well. I like fried sugar-coated dough as much as the next guy. Here is a shot of my favorite booth at the show. Check out the super giant log cabin block quilt top being used as a booth wall! Also on display was this car coated in chalk board paint. How cool is that? Everyday you could change the color of your car... one day polka dots, the next day stripes. This car will be part of the Art Tougeau Parade tomorrow. For more information click here. So, my number one daughter and I attended the opening at the Topeka Competition 29 show at the Alice Sabatini Gallery in, of course, Topeka. A very nice event. There are pictures of the exhibit here. My favorite piece in the exhibit is this plaid rhino head by Jason Shaw. Last week the All Member Show for the Lawrence Art Guild opened on the first floor level of the Hobbs-Taylor Lofts. All the guild's previous shows...at least, the ones I have seen or participated in.... have either been at the Lawrence Public Library or at the Lawrence Arts Center. But this year the guild was offered space in this new building that hasn't been leased yet, so we decided to try something new. I like the art displayed on chain link surfaces in a raw unfinished space! The only problem is the light is a bit dim on cloudy days, and the guild had to come up with volunteers to gallery sit. And I guess those are both reasons why the exhibit is only open during daylight hours. I took my turn to guard the exhibit last Sunday, which was a day that started out dark and stormy. After the rain let up, traffic through the exhibit picked up a bit and relieved the monotony, although I was glad to get time to sit and do some hand-finishing on a couple of my pieces. Because this is an Art Guild that is open to anyone, there is a great variety in the work that is entered in our shows. Paintings, ceramics, fiber, metal castings are all welcome. Here is the piece that I entered in the show, which I call "Argyle". When it was finished, it reminded me of an argyle sock. I'm not sure why it merited a pedestal by itself, since I had it wired to be hung as a painting would be, but I am glad it isn't in direct sunlight. There are a lot of beads on this quilt, but it needs a different light to show them off. I like its colors next to the concrete! Today I got to take ten quilts made by members of Kansas Art Quilters to the capitol building in Topeka, Kansas to be hung in the governor's offices. Pretty exciting! 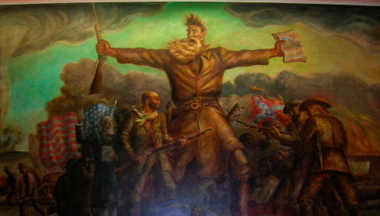 That excitable boy, John Brown, was there to greet me as I came off of the elevator. Unfortunately, the folks in charge did not want quilts from KAQ members that don't live in Kansas, and they did not have room for all of the quilts that were available. They only wanted about 10, not the 15 or so that I would have liked to hang. So, that put a damper on the day. Also disappointing was the fact that Governor Sebelius was away from her office. I would have enjoyed meeting her. But otherwise, it was an interesting trip to a big beautiful historic building. 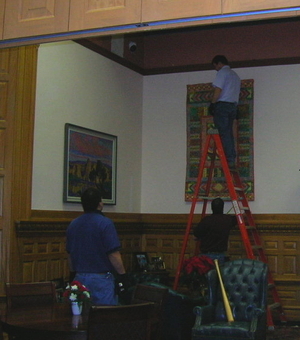 Along with the quilts, the governor's office was being decorated for the holidays...mostly the Christmas holiday...so the place was busy. My only duty (after delivering the quilts) was to watch three very helpful men with tools and a big ladder hang the quilts. And that is the way to hang quilts. I was so happy to not be the person up on the ladder! 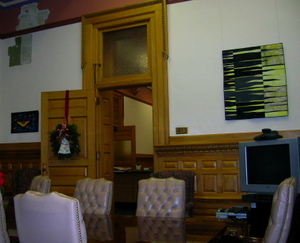 My quilts were hung in the cabinet room next to the gov. 's working office. This whole area of the capitol building is going to be renovated next summer. They have carefully removed the paint in several places on the walls to see what the original paint job looked like...and found really beautiful and ornate patterns and stenciling. I hope the funds can be found to restore at least some of it.